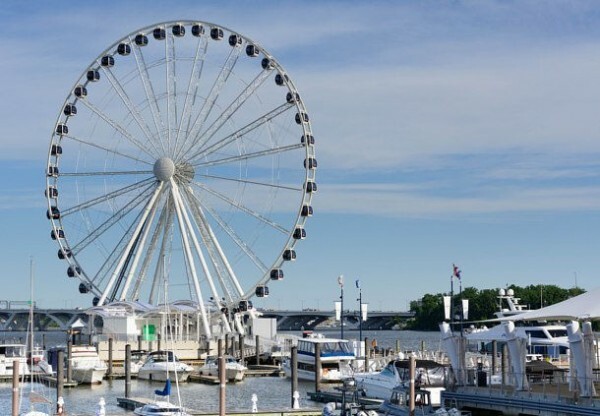 If you are planning to stay in the DC area for the long Labor Day weekend I encourage you to drive over to National Harbor and try the ferris wheel. It is simple fun, but still a thrill for the kids. 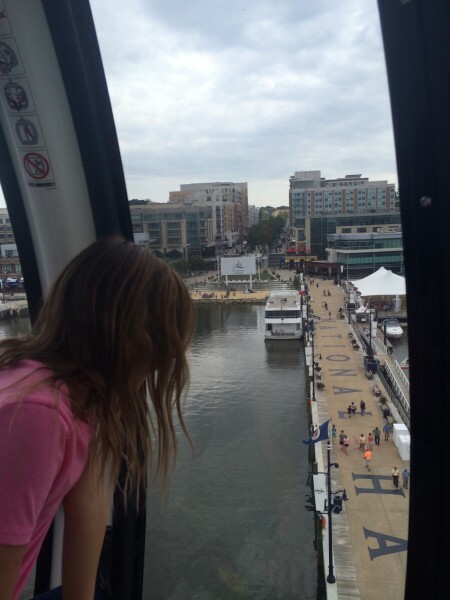 The Capital Wheel at National Harbor is 180 feet tall, has enclosed gondola type seats that are both heated and air conditioned and each compartment holds up to eight people. On a clear day you can see Old Town, National Airport, the Capitol and the Washington Monument. If you look down you’ll catch a glimpse of paddle boarders and boaters out on the Potomac River and the adorable swan and rubber duck paddle boats that you can also rent at National Harbor. We rode the ferris wheel during the day, but I can imagine it is lots of fun at night as the whole wheel lights up. Check the National Harbor calendar to plan your visit. There are free outdoor concerts on Friday nights and family friendly movies shown on Sunday nights through the end of September. At different times during the month there are also free family nights offered at the National Children’s Museum, just a two block walk from the ferris wheel. National Harbor is located in Maryland across the Potomac River from DC and is a quick 20 minute drive. In addition to the ferris wheel there are lots of restaurants and shops and a carousel. You will also find an outlet mall just up the road and Cirque De Soleil has a permanent home there. As you can see, you can easily make a day of the trip. Hours: The ferris wheel is open from 10:00 am – 11:00 pm through the end of August. Beginning in September the ferris wheel will open an hour later at 11:00 am. Tickets: Tickets can be purchased online in advance or at National Harbor. The ticket booth is located on the board walk as you approach the ferris wheel. Adults are $15.00 and children 11 and under are $11.25. Strollers are not permitted on the ferris wheel.